Does Wifaqul Ulama have a system to verify local Moon Sighting? Ques­tion: Since Wifaqul Ula­ma places great empha­sis on local (British) Moon Sight­ing, what is the sys­tem and mech­a­nism in place to ver­i­fy it? In a nut­shell, this issue was dis­cussed and rede­lib­er­at­ed in great detail at the house of (Mufti) Yusuf Sacha (DB) on Sat­ur­day the 11th of March 2017. Shaykh (DB) explained that Sha­hadah (tes­ti­mo­ny) and Khabar (news) are two dis­tinct enti­ties in Islam­ic law and must be treat­ed as such. There are rules and reg­u­la­tions per­tain­ing to accept­ing Sha­hadah (tes­ti­mo­ny). The Sha­hadah (tes­ti­mo­ny) must be accept­ed in per­son by a des­ig­nat­ed per­son (appoint­ed by a Moon Sight­ing Com­mit­tee) and they must for­ward the accept­ed Sha­hadah (tes­ti­mo­ny) to the Moon Sight­ing Com­mit­tee to delib­er­ate and make a final deci­sion. We under­stand that this list doesn’t cov­er the entire coun­try (yet) but we hope to pro­vide cov­er­age through­out the coun­try, Insha’Allah. In the mean­time Mus­lims should con­tact their near­est Wifaqul Ula­ma rep­re­sen­ta­tive for the time being. The issue of accept­ing Sha­hadah (tes­ti­mo­ny) through skype or video con­fer­enc­ing is still under delib­er­a­tion and it is not an accept­able method at this time. 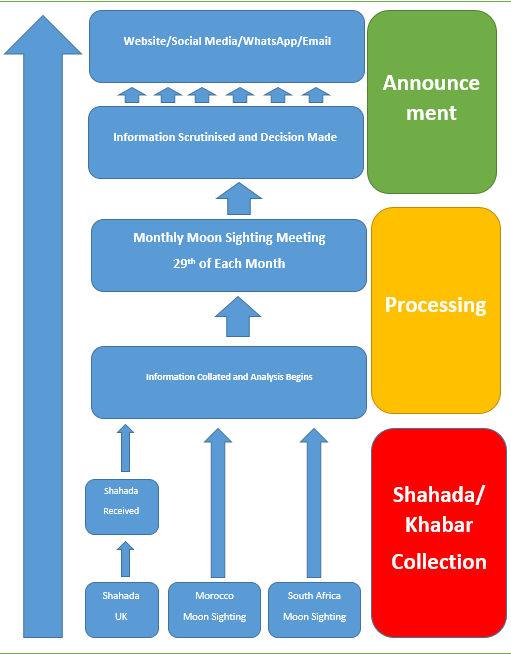 Month­ly data for (each) Islam­ic Month is wide­ly cir­cu­lat­ed by Wifaqul Ula­ma in 3 lan­guages and made avail­able to all those autho­rised to receive the Sha­hadah (tes­ti­mo­ny). It is gen­er­al­ly made avail­able before the 25th of (each) Islam­ic Month for pub­lic use. The link for “Cur­rent Month” is delib­er­ate­ly kept the same each month so Users can save and vis­it the same link every month. All of the per­son­al­i­ties men­tioned below are autho­rised to receive the Sha­hadah (tes­ti­mo­ny) and for­ward it. They are not autho­rised to make a deci­sion. Wifaqul Ula­ma Moon Sight­ing com­mit­tee will con­sid­er, scru­ti­nise and delib­er­ate on the (received) Sha­hadah (tes­ti­mo­ny) and make a final deci­sion. Any of the above who receives a Sha­hadah (tes­ti­mo­ny) will be required to com­plete this form and sub­mit it to Wifaqul Ula­ma. The form can be sub­mit­ted using any method includ­ing tak­ing a pic­ture on your phone and send­ing an image since the Moon Sight­ing Com­mit­tee needs to be informed as quick­ly as pos­si­ble. If a deci­sion is made based on the received Sha­hadah (tes­ti­mo­ny) the form will be pub­licly dis­played on our site; oth­er­wise a gen­er­al state­ment will be issued. Those who accept Sha­hadah (tes­ti­mo­ny) are to for­ward the infor­ma­tion to the Wifaqul Ula­ma Moon Sight­ing Com­mit­tee which meets after sun­set month­ly on the 29th of (each) Islam­ic Month. The com­mit­tee will make the final deci­sion. Cur­rent­ly, there are two sep­a­rate com­mit­tees in Unit­ed King­dom who delib­er­ate Moon Sight­ing (month­ly). Wifaqul Ula­ma which oper­ates and announces deci­sion on a Nation­al lev­el and Bat­ley Moon Sight­ing Com­mit­tee which oper­ates and announces deci­sion on a region­al lev­el. There is no con­flict and it is the way both have evolved (nat­u­ral­ly). The addi­tion­al dif­fer­ence is that Wifaqul Ula­ma is a Nation­al body and tends to oper­ate and adver­tise its deci­sions on a Nation­al lev­el. Addi­tion­al Schol­ars may be invit­ed and may attend from time to time but the core mem­bers who attend (month­ly) meet­ings are as fol­lows. It is not nec­es­sary for all Schol­ars to present in each meet­ing. Both com­mit­tees then con­sult each oth­er before a deci­sion is announced. Text Mes­sages and What­sApp: This method relies on oth­er Mus­lims for­ward­ing mes­sages to each oth­er. These prin­ci­ples were draft­ed by Bat­ley Moon Sight­ing Com­mit­tee (BMSC) and cir­cu­lat­ed to may Darul-Iftaas around the world and approved.